The idea for this box started with finding some F.R.O.G. – Fully Rely On God lip balm at Deseret Book and sort-of Leapfrogged from there! 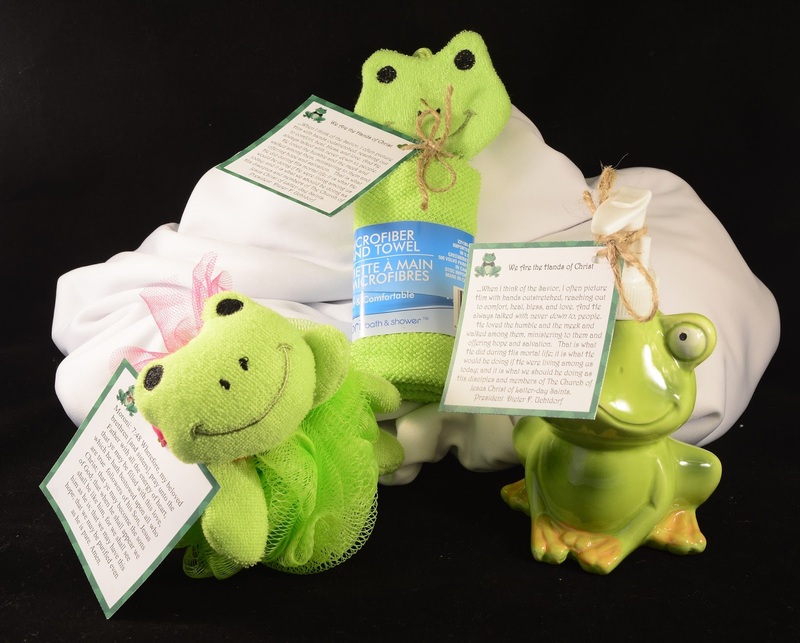 You will be surprised at how easy it is to find ‘FROGGY’ items as you shop around town. The Dollar Tree Store has a line of Baby Items that rotates animal shapes depending on the season. (Washcloths, Treat Boxes, Plates, & Bowls) So in the Spring they generally have Bumble Bees, Lady Bugs, and Frogs. I did a separate ‘Care Package’ utilizing all 3 of these animals and they turned out really cute! It is just a little extra effort that throws a big punch in the overall look and feel of your ‘Box’. If you would like to send your own ‘Fully Rely On God – F.R.O.G.’ care package to your Missionary – check out this kit we put together to do just that! ✔ 7-Pages with 34 Custom Tags that Can Be Used Throughout Your Box as Desired to continue with the theme of your care package. Ribbit Ribbit!!! One thing we always included in all of our Boxes was a personalized letter to each Missionary and their companions. Inside our letters we included our testimonies, the reason we chose that particular item to include in the box, along with uplifting messages filled with love. A lot of the items won’t make much sense as to why you are including them in the box unless you explain how it specifically applies to your Missionary and to Missionary Work. Many times over I have received thank you letters from our Missionaries – but the things they thanked us all for the most was the letters we included. It’s just a little piece of ‘Home’ in a box! So don’t forget to write! This message from Elder Jeffrey R. Holland has been hand-picked with you in mind. Though we know you have already answered the call to serve, we also know that continuing to serve with dedication and distinction is a daily choice. Please know that we love you, pray for your success, and honor your service. We hope this message helps encourage, motivate, and comfort you. The little frogs that appear here and there are a reminder of the message to Fully Rely On God, while doing all you can. From My Lily Pad to His!!! The first time I sent this ‘Box’ I sent it just on my own as a fun summer box for my son and the 3 other Elders sharing his apartment. It was a tad squishy to fit 4 of everything into the box – but it was definitely worth it for the boys – they LOVED it! Our Missionaries work so hard every single day – so it was fun to put together a ‘Just Because’ box of fun for them to enjoy and to replenish their spirits. We have since sent it to all our ‘Ward’ missionaries – and they loved it too! Depending on the size of the box you are sending – you could include or delete any of the following items below – or come up with a few of your own. Discuss the popcorn parable. For the very young just explain the analogy, for older kids ask some deeper questions, What does the heat represent? Why are we like the popcorn? What can we do to fulfill our potential? Explain that we are all Children of Heavenly Father and we all have great potential, but we have to first choose to always strive to do good and choose the right. “The Kingdom of God is like a besieged city surrounded on all sides by death. Each man (and woman) has a place on the wall to defend and noone can stand where another stands, but nothing prevents us from calling encouragement to one another”. Martin Luther, as quoted in Lewis Spitz, The Renaissance and Reformation Movements (1971), 335. The beauty of missionary work is the message we share. Yes, the church is inspired, the scriptures are true, and a living prophet guides us. However, the sole purpose of all these wonderful things is to bring people to Jesus Christ – to help others find the joy and the love and the goodness of our Savior, the true Son of God. May you be filled with the love of Christ and have the Holy Spirit with you to help you share this love with all those you encounter in your missionary service, and bring them unto Him. Thank you for your work to serve the Lord and His children. We love you and we’re cheering for you! Organize yourselves that you may Fully Rely On God. Share this Story: Last summer we lived in Texas. The wet spring brought hundreds of frogs to our backyards in the small town we were living in. The kids loved playing with the frogs. One day, the boys found a frog that had a cut on its leg. One of the boys determined the frog needed a band-aid on his leg! So he got his pack with his first aid kit in it, got at least one band-aid plastered to the frogs leg, and then proudly showed his mama his handiwork. My son is the one wearing the plastic glove; he was concerned about germs. I can only imagine what torture the frog endured to get that band-aid on him! That little frog in Texas had a problem that was bigger than he could handle; a big cut. But there were hands there to help with first aid kits and sterile gloves. While our little 5 year old boys probably made the problem worse for this frog, a perfect God can be trusted to mend out cut legs perfectly. We can fully rely of God like this frog, and that means we let Him take care of things that are too big for us to handle on our own. It means that we let Him help us feel better when we’re scared, or sad. We can also rely on God when we don’t know what to do. I feel like God works with us; like the brother of Jared and like Nephi. We are not alone in the challenges, the sadness, pain, or even the success. Wherefore, my beloved brethren (and sisters), pray unto the Father with all the energy of heart, that ye may be filled with this love, which he hath bestowed upon all who are true followers of his Son, Jesus Christ; that ye may become the sons of God; that when he shall appear we shall be like him, for we shall see him as he is; that we may have this hope; that we may be purified even as he is pure. Amen. Stress Reliever Frogs: Frogs have it easy… They eat what bugs them! Frog Key Chain w/tongues that roll out when you squeeze them. If life is compared to a river, it is easy to imagine floating with the current ‘gently down the stream’, but I have never found any good and worthwhile thing that came of its own accord, just the opposite. Every worthy goal takes constant, if gentle effort. There is nothing static in the universe, after all. Fortunately the Lord does not require us to run faster than we have strength, (or row faster!) Amulek’s warning against procrastination is so perfect. “You cannot say, when ye are brought to that awful crisis, that I will repent…” There is a point of no return in just about everything. Items Needed: Toy Frog, $1 bill, mirror, picture of someone, fortune cookie, toy car or Lego toy, Card with the word God on it. Ask: Do you know what “FROG” means? On a Chalkboard, Whiteboard, or piece of paper write the following so that everyone can see it. What do you and I rely on or trust or lean on? Do we trust in God? Or are we fully relying on something else? We trust cars and airplanes to get us where we are going. We trust the bank to give us money from our account. We trust people to do what they say they will do. We trust our own abilities to do for ourselves. We sometimes trust in horoscopes/stars/luck/chance and gamble hoping to get something for nothing. If we believe in Jesus Christ, we have trusted in God. But, do we trust Him to keep us and provide for us and lead us in the choices we make? Do we trust Him to help us love those who are not loveable, to do the things that are really hard for us? God wants us to keep on leaning on Him every day. He wants us to fully rely on Him. When you see a frog let it remind you to Fully Rely On God, and to trust God with all your heart and to lean on Him every day, not just on your own understanding!